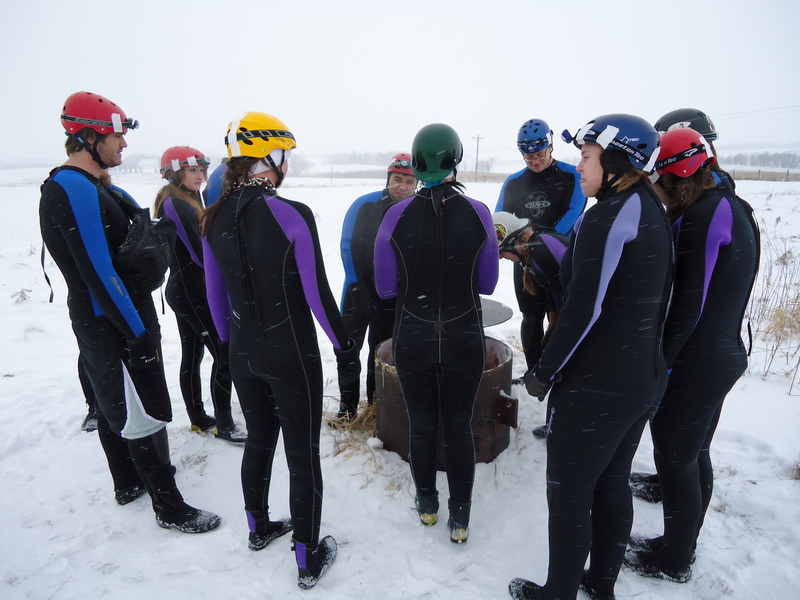 The landscape was hilly, but quintessentially Iowa: nearby was an old windmill and not much further away a church, an idyllic late-winter landscape rendered slightly surreal by the 20 wetsuit-clad people standing in a circle in the middle of the field. We waited there to descend, one on the ladder at a time, down the shaft’s warm air 180 feet into the dark. There are three ways in to Coldwater Cave – which, with 17.5 miles of tunnels, is the 33rd largest cave in the United States. The first entrance, discovered in 1967, starts in Coldwater Spring; it requires scuba gear and has not been used in decades. When John Ackerman, Minneapolis-based furniture upholsterer and caving enthusiast, was denied access to the second entrance (a 94-foot shaft drilled four years later by the Iowa Geological Survey), he – not without conflict and controversy – drilled his own. This was the entrance through which we went to spend the afternoon wading – sometime swimming – up several miles of underground river, guided by our gracious and enthusiastic host. For more information on Coldwater (and the controversy over its ownership and entrances) check out this 2009 article from Iowa Outdoors magazine, posted online at Ackerman’s web site. For the February’s trip described above, I was primarily along for the experience, offered to BVU students and staff through the Department of Outdoor Recreation. I also took the above picture and wrote this story for the University’s web site. Telling about these things is my job; the experiences and people along the way are some of its best parts. For recent web stories, I’ve interviewed an alum returning to Japan to help with disaster relief and students raising funds and awareness to help the local high school music programs. My most in-depth BVU stories, however, appear in print, in the magazine BV Today and alumni publication BV Briefs. The most recent issue of Today dropped last month; I’ve included in this post PDFs of feature stories I wrote that appear in it, as well as ones from two past issues. Enjoy! “That Much Further West” (Feb 2011) tells the story of media studies professor Dr. Bruce Ellingson’s six months of travels to capture western America’s national parks via ‘high dynamic range’ photography – and how he utilizes the Internet to promote his work . Bruce and wife, Margie, traverse two landscapes – the iconic American West, and the brave new world of social media. I borrowed the title from a song and album from the band Lucero, who – like the story – deal thematically in Americana. You owe it to yourself to check out Bruce’s pictures on Flickr – I could describe them with adjectives, but they’d only sound exaggerated. This feature was quoted in a subsequent story in the Des Moines Register. “Opportunity, Next Exit” (Feb 2011) covers the winding career path of Brad and Dee, a husband-and-wife pair of alum, from internships in the Mexico Desert to an on-campus student business selling carpet scraps to a major street paving project in Omaha to hearing aids to software. Opening the story is an interview with Brad’s mentor, owner of a southwestern convenience store empire that was – however one may view the enterprise – instrumental in the shift in economy on Native American reservations from barter and trade to cash-based. “A Changing Practice” (Feb 2010) covers the career of an alum from a college football career cut short to becoming one of Phoenix’s most prominent cosmetic surgeons, in the process touching on changes in cosmetic medicine throughout the 2000s and how the ‘Great Recession’ hit Phoenix and affected people’s outlook on cosmetic procedures. *Also, unrelated to anything above, last Saturday I recorded the concert of a friend – Cherokee, Iowa-based musician Andy Juhl – utilizing an experimental setup to cover nine musicians on stage with six relatively inexpensive cameras. Some of the footage has begun to trickle onto his Facebook page.